Metronode was looking to implement a new expense management system after the separation of its network and data center businesses. 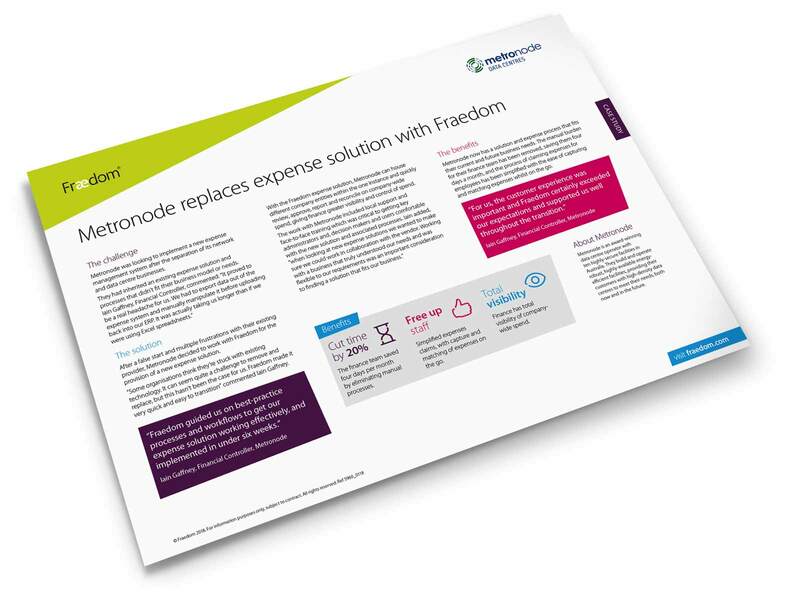 After a false start and multiple frustrations with their existing provider, Metronode decided to work with Fraedom for the provision of a new expense solution. “Some organizations think they’re stuck with existing technology. It can seem quite a challenge to remove and replace, but this hasn’t been the case for us. Fraedom made it very quick and easy to transition” commented Iain Gaffney. Metronode now has a solution and expense process that fits their current and future business needs. The manual burden for their finance team has been removed, saving them four days a month, and the process of claiming expenses for employees has been simplified with the ease of capturing and matching expenses whilst on the go.